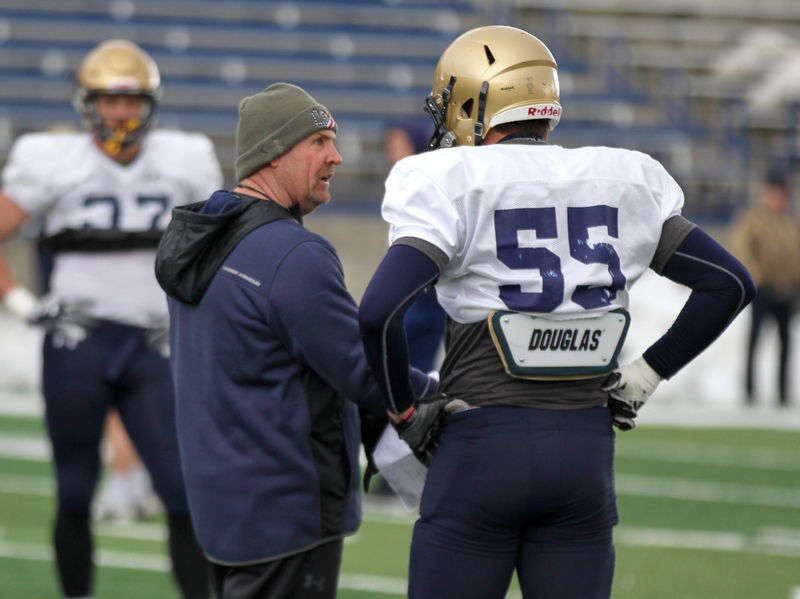 BOZEMAN — Jeff Choate described Jabarri Johnson’s potential season-ending injury as “a dark cloud” over the Montana State football team leading up to the first scrimmage of spring football. 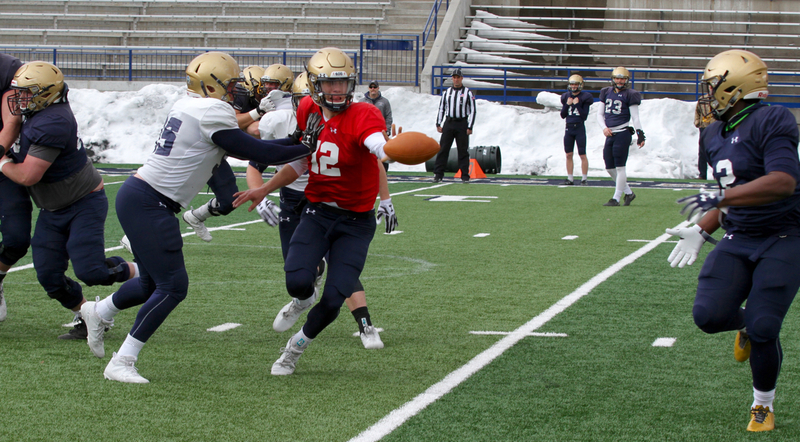 After a week to emerge from the shadows, a Bobcat offense paced by emerging star Willie Patterson shined during a morning scrimmage on Good Friday as Montana State closes in on the completion of its three spring session under Choate. The morning started with below-freezing temperatures and a biting wind before the sunshine broke through, just like Patterson has emerged over the last four weeks. The redshirt freshman from Tacoma, Washington did not wait for temperatures to rise, instead ripping off an 11-yard gain on a sweep play, then catching a 14-yard touchdown pass from junior Chris Murray to cap a 65-yard touchdown on MSU’s first offensive possession of the 55-play competition. 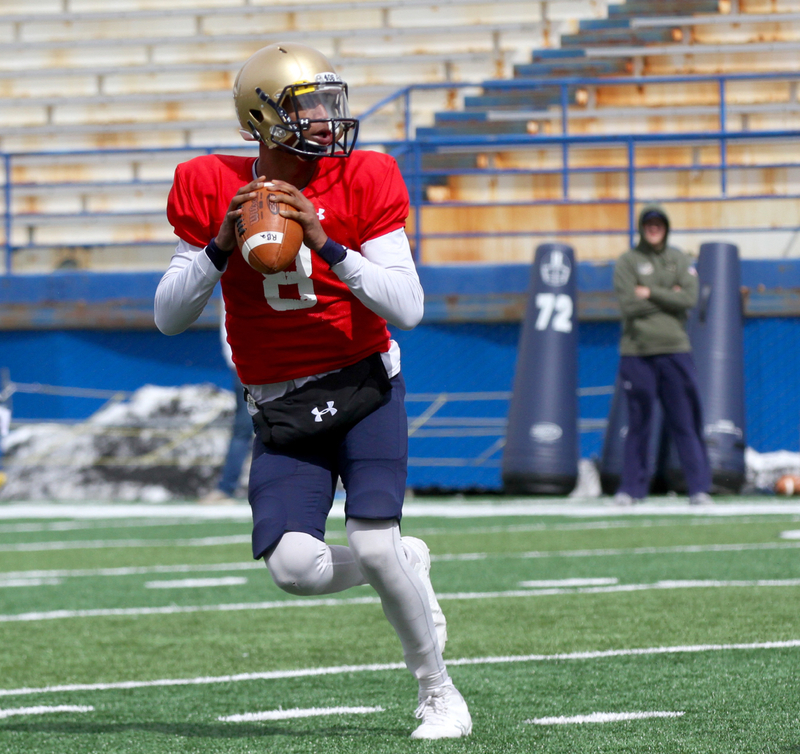 The former high school quarterback has show a diverse abilty to dice defenses, using his keen field vision to set up blocks when he gets the ball on jet and fly sweep motions. He has also shown good route running skill and sticky hands in the passing game. He finished Saturday with 31 rushing on three carries and caught a scrimmage-high four passes for 32 yards and another touchdown. Johnson, a 6-foot-4 senior who is MSU’s returning leader in catches, yards and touchdowns, suffered what is likely a season-ending knee injury on a one-on-one passing drill a little more than a week ago. The injury caused for a shuffling of MSU’s largely inexperienced receiving corps. 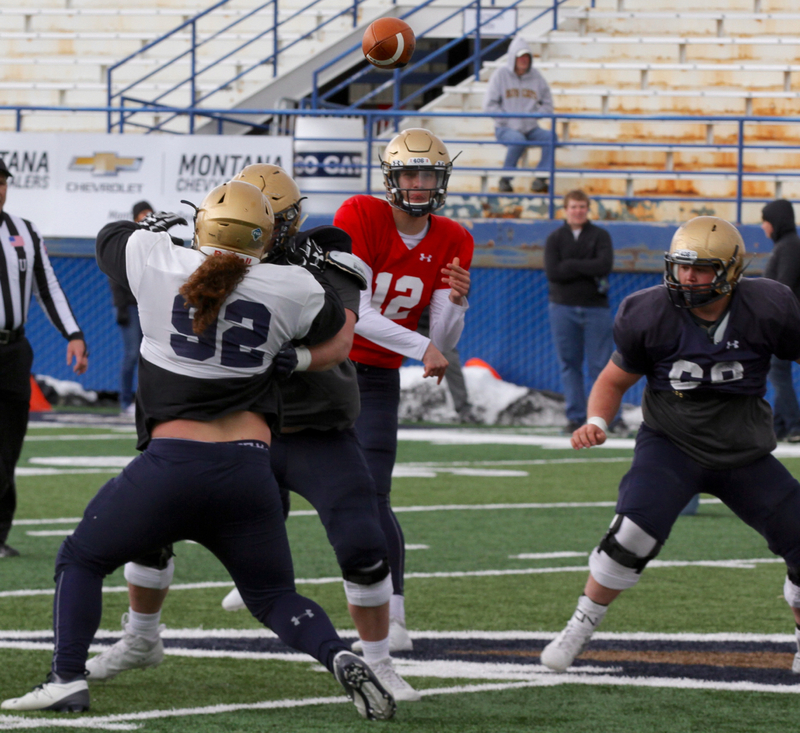 Junior Kevin Kassis, the starter in the slot the last two seasons, has moved to the outside where he will compete for reps with true sophomore Lance McCutcheon, redshirt freshmen Peyton Hanser, James Campbell, and Kapili Livingston-Lopez. 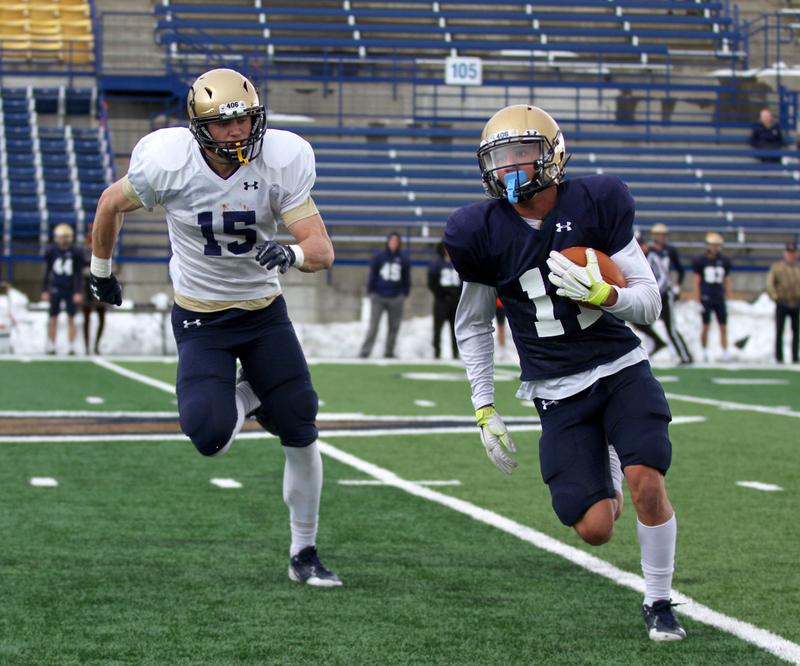 Senior John D’Agostino is still making his way back from knee surgery that ended last season but should be in the mix at X receiver as well. 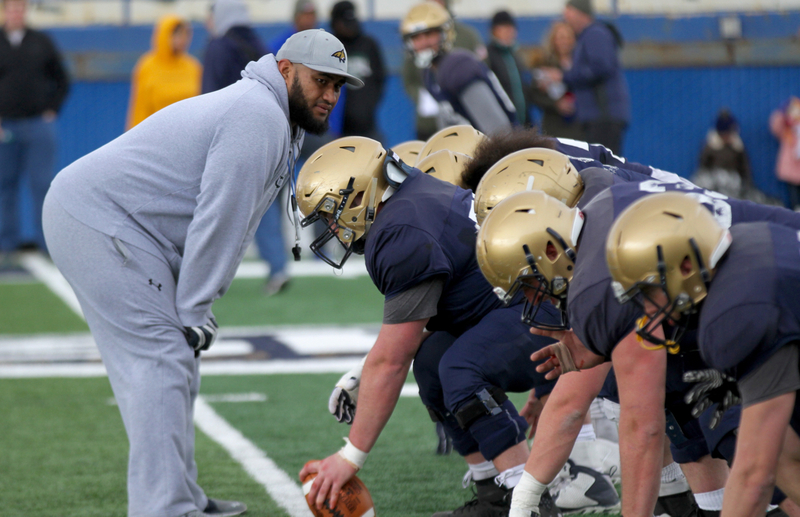 “I knew my chance was going to come this spring and I knew I needed to separate myself so I really worked hard through the off-season and through the six-week training period before the season and I knew once it was spring ball, it was time to go,” Patterson said. Kassis’ move from the inside to the outside and junior Karl Tucker II’s move to running back means elevated opportunities for Patterson and fellow redshirt freshman Coy Steel. Both have had standout springs. “I think I’m starting to separate myself from being a redshirt to now to being someone who can contribute to the team,” Patterson said. 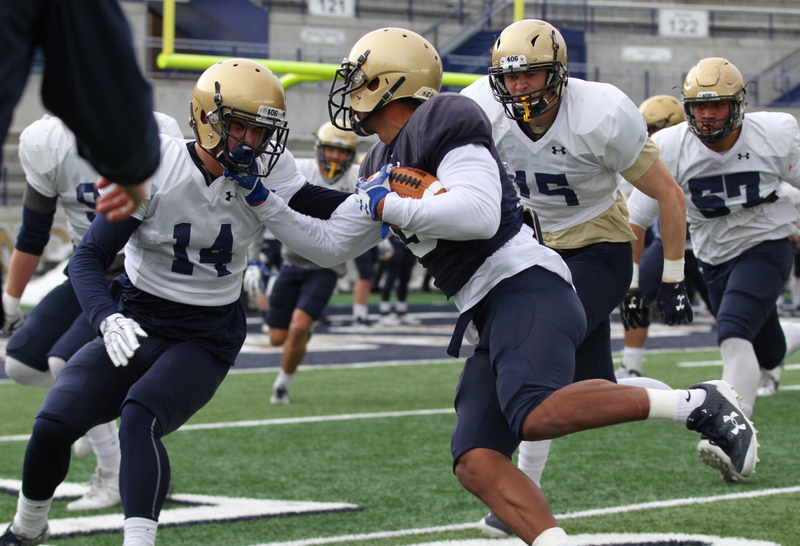 “I’m not glad that I redshirted but I’m definitely seeing the benefits of it now. Now you can see the off-season training is coming into effect and you can see out there me making plays. The 5-foot-9, 176-pound former two-star recruit wears No. 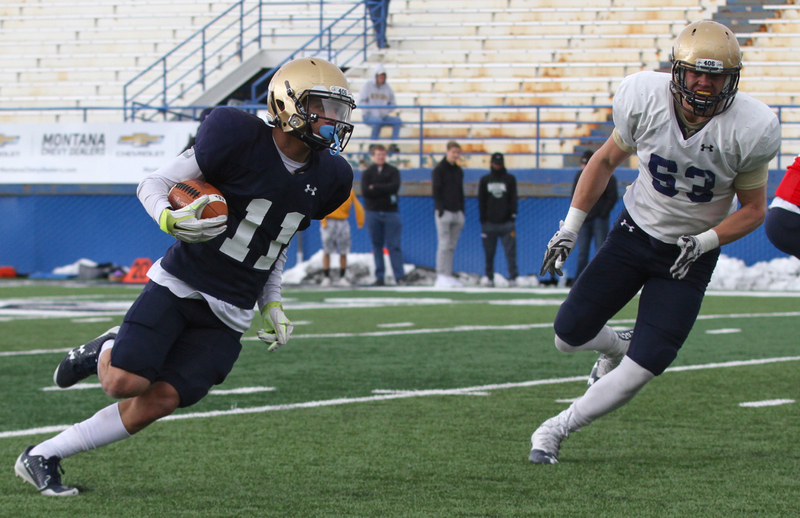 11 for Montana State, the same number he wore as a quarterback who earned Washington 2A South Puget Sound League Offensive Player of the Year honors. As a senior at Franklin Pierce, he threw for 2,723 yards and 35 touchdowns and rushed for 1,659 yards and 21 more touchdowns before Franklin Pierce lost in the second round of the Washington 2A state playoffs. He threw for 3,115 yards and 35 touchdowns while rushing for 720 more during his junior season. He earned first-team All-State honors as a multi-purpose player thanks to a 92-yard kick return for a score, an 86-yard punt return for a touchdown, four interceptions and an interception return for a score. He was voted the Tacoma Athlete of the Year as a junior. Patterson’s abilities in the horizontal run game gives an added element to MSU’s triple option run game, helping the offense press the edges in an effort to loosen things up for the electric Murray. 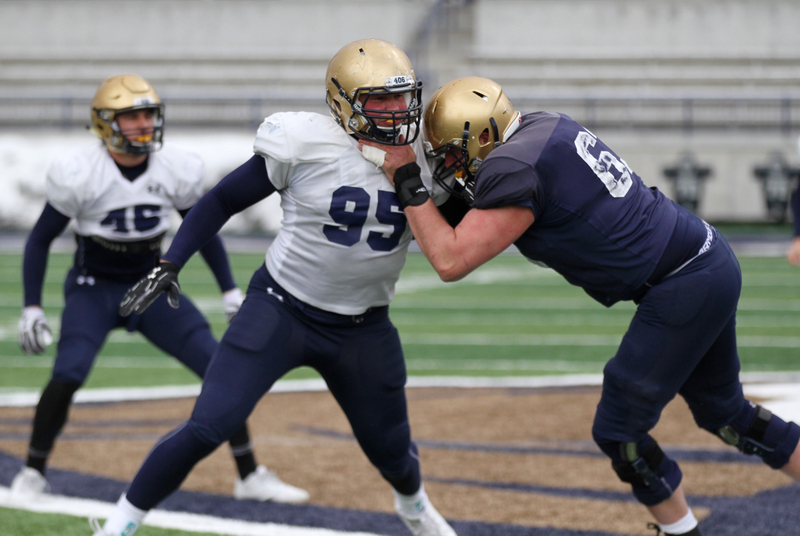 The Bobcats have also seen the emergence of Tucker and the added physical presence of Indiana transfer Tyler Natee, a 6-foot, 270-pound battering ram. On Friday, Tucker rushed six times for 31 yards while Natee totaled 35 yards on eight carries, including 12 yards on the opening touchdown drive. Murray added 13 yards on three carries. The production in the run game and the diversity added by Patterson and Steel helped the quarterbacks, particularly Murray, look efficient despite the wind. 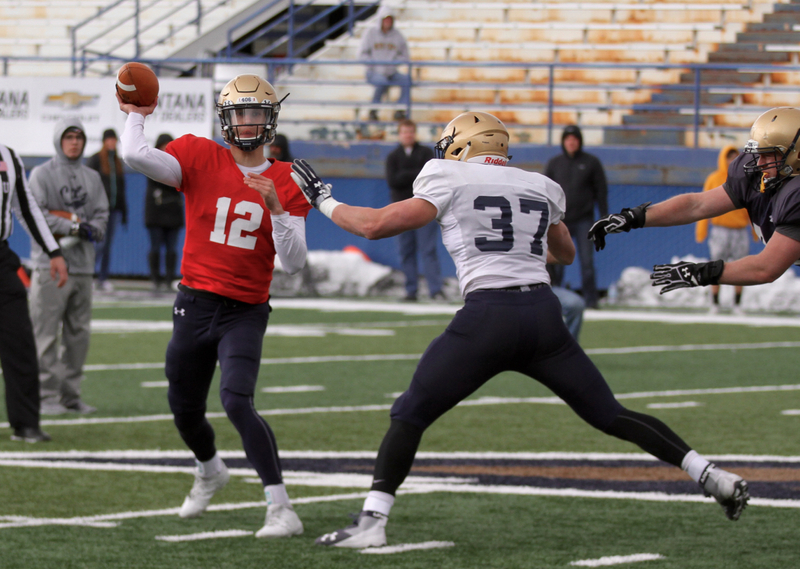 Around the same time Johnson suffered his injury, junior quarterback Brady McChesney elected to retire, leaving just Murray and redshirt freshman Tucker Rovig to take snaps this spring. 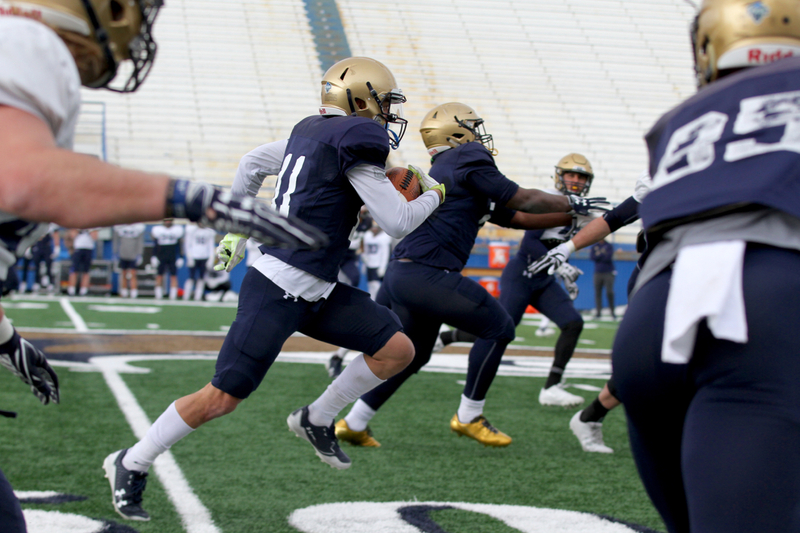 Murray finished Friday’s session 6-of-11 for 46 yards and the touchdown to Patterson. 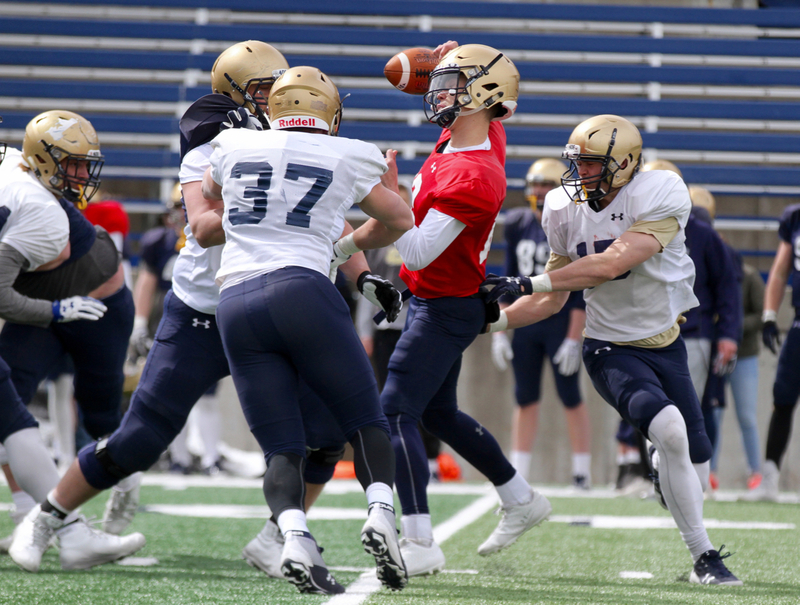 Less than a week after taking eight touch sacks and struggling to find any rhythm, Rovig looked better, completing 5-of-12 passes for 48 yards, including finding Hanser three times for 34 yards. “The one thing I was pleased with was that Chris in particular didn’t force the ball,” Choate said, adding that Murray’s physical improvements have transferred to the field. “Chris is stronger, and I think that’s noticeable. He is pushing the ball more, he’s got more velocity on his throws, and I really was pleased with his poise and the way we’ve run the offense. The Bobcat offense scored on three of the day’s six play-it drives. Tristan Bailey (35 yards) and Jacob Byrne (33 yards) each converted field goals. 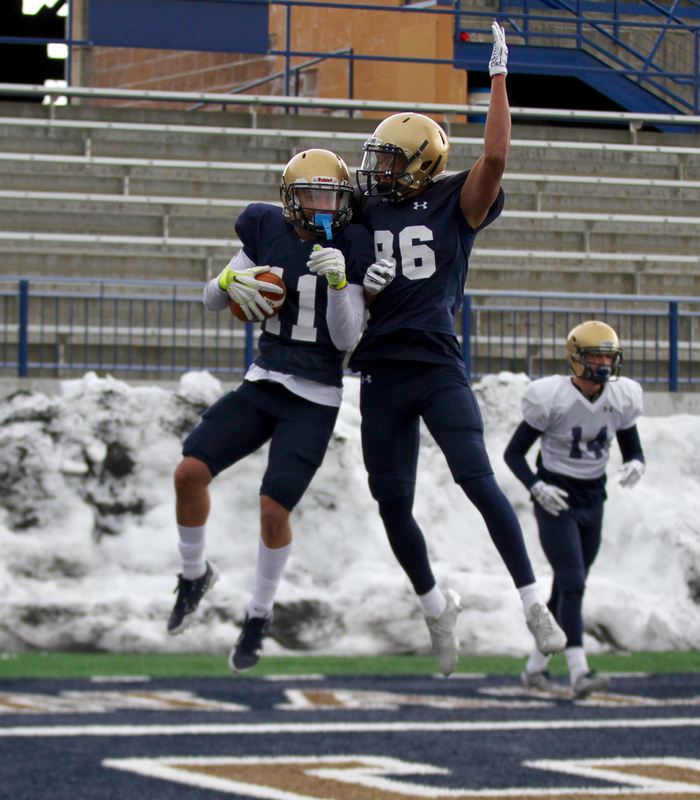 In the team’s brief red zone work, Natee scored from one yard out and Bailey kicked a 23-yard field goal. 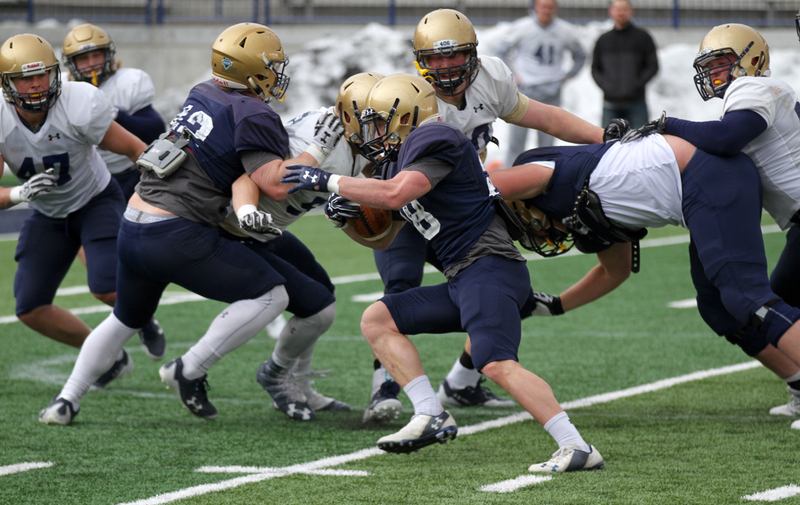 “I don’t know if we will do this many plays next Saturday,” Choate said. “This was kind of let’s get the work done we need to get done, let’s continue to polish things next week, get 40 plays and good fan engagement, make it more of an event than a scrimmage. RUSHING: Tyler Natee 8-35-1, Karl Tucker II 6-31-0, Tucker Rovig 4-17-0, Chris Murray 3-13-0, Willie Patterson 3-31-0, Coy Steel 1-1-0. PASSING: Chris Murray 6-11-0, 46, 1 TD; Tucker Rovig 5-12-0, 48, 0. RECEIVING: Willie Patterson 4-32-1, Peyton Hanser 3-34-0, Tyler Natee 1-11-0, Lance McCutcheon 1-5-0, Karl Tucker II 2-15-0. FIELD GOALS: Tristan Bailey 2-2 (35 made, 23 made), Jacob Byrne 1-1 (23 made). Note: Skyline Sports also recorded sacks for Troy Andersen, Bryce Sterk, Elu Leota & Kyle Finch.